Hamilton, a riverside residential suburb, is six km north-east of central Brisbane. It is reached by the Breakfast Creek bridge and Kingsford Smith Drive (formerly Hamilton Road). The first bridge over Breakfast Creek was built in 1836, coinciding with the transfer of female prisoners to a stockade on the Eagle Farm flats north-east of Hamilton. In 1837 the Hamilton Reach (riverside) road was built by convict labour. Most of Hamilton, except Albion Park and the riverside east of Racecourse Road, is elevated and by the 1860s it was noted for fine villas and 'gentlemen's estates'. The Queensland Turf Club held its first race meeting at Eagle Farm in 1865, at about the time when the Hamilton Hotel opened and gave the suburb its name. Hamilton was placed under the Toombul local government division (1883), but in 1890 it was made a separate division of nine sq km, retaining in its area Toombul's hall and offices. Hamilton Board's first chairman was Andrew Petrie, son of Brisbane's first mayor, John Petrie, and later the local parliamentarian for the Toombul electorate. Hamilton had horse-drawn bus and tram services via the Breakfast Creek bridge to the city, but in 1899 these were replaced by an electric tram terminating at the end of Racecourse Road. The riverside suburb of Hamilton was mainly residential, flanked by the Albion Park and Eagle Farm racecourses, Henley-on-Brisbane rowing (1910) and, to the east, the Royal Queensland Golf Links (1920). Hamilton State primary school opened in 1907. There was little industry - a Council quarry, a pottery works, cotton gin and government cold stores adjoining shipping berths along Hamilton Reach. One of the best known shipping berths, Bretts Wharf (1928) was a busy area during World War II and the location of a ferry crossing from Bulimba. It is now a terminus for the City Cat river service and the venue for a celebrated seafood restaurant. The Hamilton division was designated a town in 1904, as urbanisation was fostered by the tram service. During 1911-21 the municipality's population increased by 81%, and the suburb's population by 175%. The old hall and offices were replaced in 1921 by a handsome verandahed brick building, decorated with Albion Pottery glazed tiles, at the corner of Racecourse Road and Rossiter Parade. It is listed on the Queensland heritage register. In the midst of inter-war housing growth, Hamilton town was incorporated into the Greater Brisbane Council in 1925. The council had planted ornamental and shade trees along the main roads, laid out Crosby Park (next to Albion racecourse), connected electricity to most houses and sponsored band performances in Ascot Park, next to Eagle Farm racecourse. 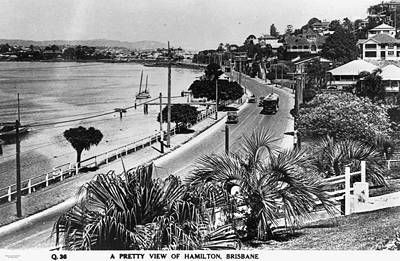 The Brisbane centenary souvenir (1924) considered Hamilton to be the most picturesque suburb of Brisbane. Seven residences are listed on the Queensland heritage register. The commercial centre along Racecourse Road included the Hamilton Hotel, the Hamilton post office and store, St Augustine's Anglican church and kindergarten, the Arcadia picture theatre and the Ascot Garage. 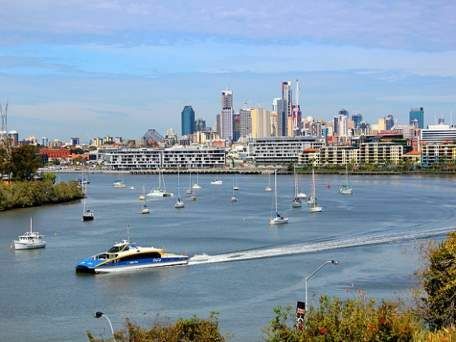 The suburb of Hamilton is best known for Kingsford Smith Drive to the Brisbane Airport. Running beside Hamilton Reach, Brisbane River, the Drive is a much used arterial route, with motorists looking ahead rather than to the north where Hamilton's best environs are found. 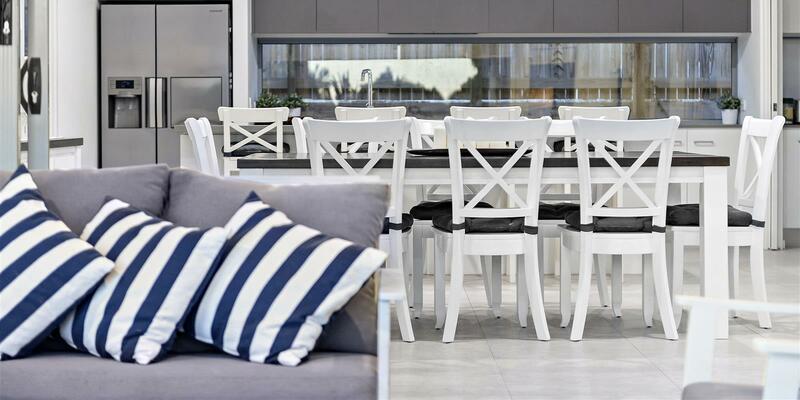 Being a sought-after area, the environs are increasingly occupied by units and apartments. In 2008 plans were underway for several redevelopment projects east of Bretts Wharf, including Hamilton Harbour (apartments and housing) and Portside Wharf (retailing and transport terminal).